Today is the day we I have been dreading worrying about anticipating for so long. We’ve been preparing for this day for over a year; occupational therapy/sensory integration therapy, speech/language therapy and pragmatics, ABA, fine motor skills, self-calming techniques and coping skills, social skills, countless social stories and most recently several trips to his new school along with a practice bus ride. So many brilliant, wonderful teachers and therapists have played such an important role in our lives!!! We could not have done it without them! All for Henry’s first day of mainstream (full day!) Kindergarten … and beyond. It’s been a few hours since he climbed right up on that bus. No fuss, no muss. Surprisingly, I haven’t yet shed a tear. A wonderful friend stopped by with some beautiful flowers. We chatted about our boys’ new experiences over coffee. I am feeling slightly less anxious. I will be busy today which I hope will be helpful . I am remembering the conversation I had last night with my little dude at bedtime. We talked a bit about what his day will be like. He was anxious I could tell. “Well, I could change my name.” He tells me, laughing! “Change your name? What would you change it too? “I don’t know…how about Komondo?” he says with a new burst of giggles. The next few minutes are spent sounding out the new name and picking letters that work to spell it out. He’s done with our “serious” conversation. It’s time for them to settle down and get some sleep so I try one last ditch effort to assure myself him that everything will be okay. For some reason he did seem to really take this in and accept it. At least in that moment. “Okay, Mom.” We said our good-nights and both my littlest ones settled in for sleep. Everyone slept through the night! We kept this morning as routine as possible and just added in waiting-for-the-bus and getting-on-the -bus as if it were nothing too out of the ordinary. And soon enough Komondo will be home again! 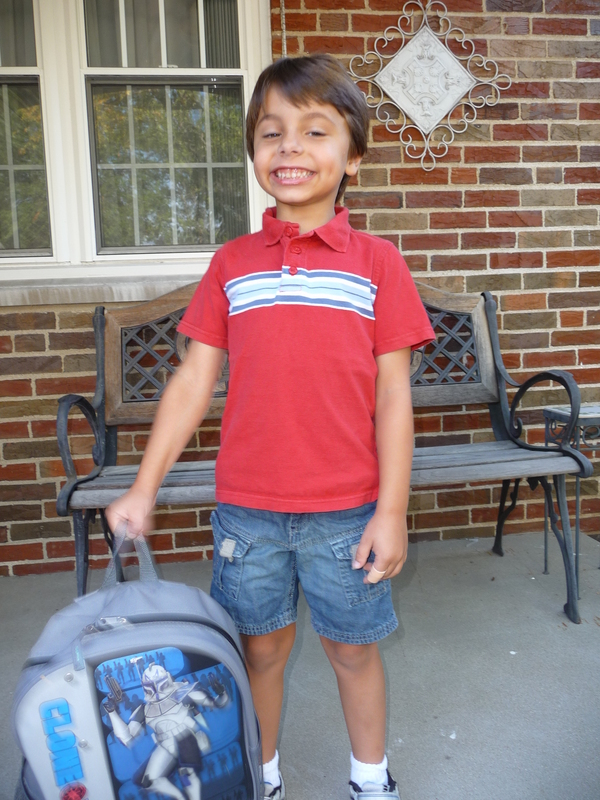 His first day of Kindergarten completed!